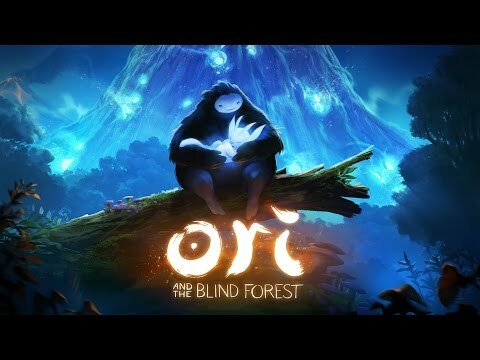 Will be really amazing, if somebody create new Norn species based on "Ori and The Blind Forest" characters. Not a full copies, but somethind that will remind ingame characters. Dragoler: Do you mean Mr Fluffybuns? A version of the Cannibalism script that allows creatures to only eat dead bodies. And more snow-y metarooms? The North Pole isn't good enough for me and Chione is too empty. If you want a suggestion for a name, how about Artic Terrarium? Chione's agents are in progress, I believe . There's been some mention of a 3D Creatures fangame, buuut I'd kind of be more interested to see a 2D fangame based on the lore that Steve Grand originally wrote for the Creatures series. I've been thinking of making a genetic breed of norn that can develop cancer if they are exposed to heavy metals for a specific period of time - is there a way for it to attack specific organs or should I just make chemical reactions in stages e.g: A norn that comes into contact with heavy metals develops a benign cancer chemical. This cancer then reacts with the norns energy (albeit very slowly) to create a more malignant cancer chemical, which consumes a lot more of the norns energy and begins to secrete antigens which damage the norn's organs. Of course, the chemicals would begin to increase within the norns bloodstream and require treatment by giving them chemical injections, otherwise they would completely destroy the norn's organs and lead to death. The way you'd make it attack specific organs is to give only some organs an Injury receptor for the chemical. If the organ doesn't have a receptor for the chemical it can't respond to its presence. Sooo... a reverse blockworld alpha? I guess there could be some other aspects to the room to make it more unique. That wasn't supposed to be critique, lol. Oh, silly of me to interpret it as that then! I have another idea with me right now actually, how about a gadget which is shaped like an oversized toy rocket, except it faces horizontally. When activated by a signal or manually it will pick up the nearest creature(s) and hastily fly them off to the direction it is facing (could change direction depending on if the input is positive/negative) however it would still fall if there is no ground below it, even if it's in the middle of a flight. It classes as light weight whilst it in flight. I think Rocket-Car would be an appropiate name for it! Another idea for it too; what if the distance it travels also depends on the input it receives? Any thoughts on Fallout-themed agents and/or Metarooms? I had the idea for Norns to wear Power Armor, give them an edge against Banshee Grendels, assuming the Grendels are more like Super Mutants. Which leads to another idea: Super Mutant Grendels, or FEV Grendels as a shorter name. These Grendels may be the bane of all Norn existance, even when the furballs are augmented with that West-Tek Internal Servo System. My Ettinchi, Tommie, she's pouring all her research into defending a Norn contingent with Energy-based munitions. Sounds like something that the Shee would oppose. But Tommie knows that this same bibble molded her into the industrialist that she valued most over all other societies. Perhaps it was her destiny to give Norns a means to defend themselves. Or maybe the threat of the Banshee's experiments preying on the Norns surely influenced her decision to make the ARK safer for Norns. Whatever her intentions, she built the finest energy weapons for the Norns. With their new arsenal, they eventually liberated both the Ark and Capillata from the Banshee. With the Norns decisive victory, came a price, while they managed to kill most of the Grendels, the remainder escaped to the nearby planet of Sphericus, where they spent the next several years plotting an ambush for when the Norns bring the docked complex to the ground. However, of many of those Norns, one would spearhead the defense of that ambush, but that-- is a story for another day. . .
Little idea I've come up with recently: How about a puzzle game, playable from the comms room menu? Probably likely to be something simple like lights out or something like that. And when I say playable from the comms room menu, I mean it literally is a comms room window in itself, though I dunno about the possibility of doing this, if it turns out to be impossible then it'd be alright as it's own thing. Norns that don't need to eat or sleep much at all get bored easily and get lonely very easily. They just love to have fun over anything else in the world. To thrive they would need lots of toys and other creatures to hang around with. They don't care for crowding at all and prefer to congregate in areas all in one big group. They also like most creatures and don't really develop any dislike for any creatures even though they can and probably will get slapped around a lot by others. Their breeding is sporadic but they age at a faster rate than most norns. The longest stage is their youth, these norns live for it. Once they age into adults however, their progression speeds up significantly. 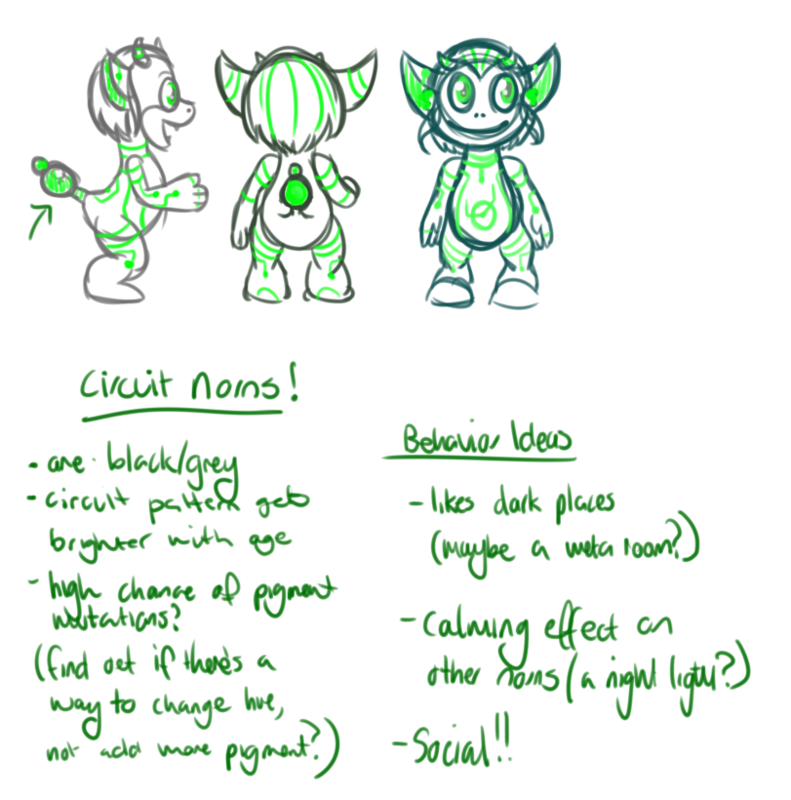 I don't quite know if all these ideas for this breed are implementable but it's just an idea after all. I have a bunch of other ones but this one just seemed to be the easiest to brainstorm. Does anyone remember someone making a left/west spitting Aquatic Launcher for C3/DS? I remember it being talked about, and I thought it was finished and that I had it, but I can't find it in my Archives. If no one remembers it can someone take pity on me and make one? A patch for the C2 cacti that makes their seeds edible in the same way as the triffid seeds are. Jotted down a little breed idea. Considering I have no idea about things like genetics or making agents, if I were to do this, it'd be a long way off! They'd be a charcoal grey and the pigment in their markings would get brighter with age. I'd also wanna make them have a high chance of pigment mutations so you'd have a nice pretty rainbow assortment of them! Their tails would give off a bit of a glow too. I know lighting and particle effects aren't possible in the engine so it'd all be sprite-based. Not sure how it'd look in-game, though.. Anyway, when I get some free time, I might look into it! I'm not a 3D modeller but I"m handy with Manga Studio so the sprites would most likely be hand painted. It'd probably look a bit off with the art style but if I were to ever do a meta room in the same style, there'd at least be that, right? Anyway, most of these things seem fairly doable to me, maybe except of that calming effect. They could get calm themselves around creatures, but I am not sure how they could influence other creatures besides simply being there or maybe smooch them in a harmless way. For the coloration part, it would literally just involve pinning down the pigments on 128/128/128 with little to no mutation rate, while letting the swap and rotation go crazy. That should be pretty much exactly what you imagined, although it may happen a little slower than you'd hope to. I would say it would behave similar to color mutations in other creatures: it is kinda hard to get going in the first place, but once the ball is rolling, there's rainbows everywhere. Can I add an idea myself? How about, when they get really old, they start showing minor damages, at least in their sprites? 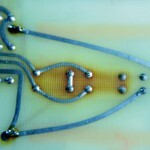 If you imagined them like a literal circuit board, how about ugly brown spots? It happens with most circuits in the long run. Components degrade, things start getting hotter and eventually leave these type of "burn marks" before failing completely. Hm, that sounds pretty logical. I remember being really fond of the chromatic norns when I used to play (Just got back into it all) because of rainbows everywhere! It'll be a while before I get to the stage where I can begin work on them, but thanks for the feedback! Don't forget that pigment swap and rotation affect all colors on the sprite. When you swap and rotate green into e.g. pink, then the supposedly red stripes suddenly turn blue or something like that. Yeah. It's like moving the hue slider in photoshop and it affects all life stages at once. Not something I can really control. Even just dimming the stripes could be effective, though I love the glitchiness idea so I"ll probably do that! Oh hey I didn't realize a little ideas thing was here. (I am so observant.) Since I can't really make breeds myself I might as well share any I had in case someone else likes them. I had an idea for a Norn Breed when I was a freshman in highschool (so like over a decade ago? Oh god). I believe I called it a Wave Norn. It wouldn't be genetically different from the average norn, but it would start out pure white with dark blue hair. As it grows older the dark blue of its hair would spread over its body at each life stage, like an ocean wave, until the body of the full grown adult is completely dark blue and its hair is now white. It sounded a lot cooler when I was 14. A patch for the C2 incubator room's teleporter that makes it invisible. Here's an idea I've been kicking around. You know how annoying it is when a metaroom's ecology doesn't work quite right. (Not a question--I'm pretty sure we all do.) Well, there was an interesting Star Wars game a while back that focused on creating a stable ecology. It actually let you invent your own critters and specify the parameters like what they ate, how fast they reproduced, etc. It would be cool to have something like that for Creatures. Say you have a "library" of basic critter types to choose from, so you can say, "I want my critter to use the bird sprites and be tinted blue," and the game will automatically handle the animations, behaviors, et cetera, by using a kind of template... but you could choose to make your bird eat things of a certain classifier (eg. only dragonflies, only Albian apples) or from a certain category (any critter, any edible fruit)... could tweak how long it goes between meals, how long it lives, how often/how many times it reproduces, etc. Similar properties could be set for plants. Patch plants basically work that way already: you set growth variables for them, the only difference is they spawn from a patch instead of reproducing naturally. I dunno how many people would have the patience to sit around tweaking stats for their critters and plants until the ecology they'd built was stable, but it seems like it would be interesting to give folks the building blocks to experiment with that level of the ecology without having to actually code new agents themselves. It might even be possible to add a 'genetic/mutant' toggle, so that subsequent generations could evolve to have different requirements. An idea I've had is a series of sprite replacements for C3/DS that make it look more like C1/C2. I never minded the appearance of C3/DS myself (chalk it up to it being the game I started the series with), but it'd be nice to have C2-style creatures, if not an entire C2-styled world, in C3/DS (I love C2's aesthetics, but I can't stand the gameplay). Here's another Undertale-themed Agent for C3/DS: Toriel Dreemurr. Her role as critter is simple, keep the baby and children Norns well-fed and entertained. She also teaches all the essential vocab for Norns, which excludes common nouns for food, toys, and gadgets. Speaking of vocab, Norns oughta know how to program certain devices, or operate them on a higher level, rather than just push and pull. Why not give norns a keyboard/special PC gadget? Who knows, perhaps Creatures can give the Hand-Player suggestions on how to use CAOS with IDEs that support the language? For instance, the QCM seems to vanish whenever I use it. Could this be a bug, or is there something I missed, to make it useable? The game doesn't tell me what went wrong, no error prompt, nada. UPDATE: Turns out the recipes catalogue was in My Documents. It should work now. Something I was thinking of (that I could provide the sprites for, but have 0 knowledge of CAOS and coding in general!) was a sort of crow or raven critter/beast that can hop or fly around. When pushed it'll either teach some random word (corvids are incredibly good at mimicking speech ) or perhaps give nearby creatures a random, silly command (like eat norn, those mischievous birds) but when hit will peck at the creature and discourage it from hitting, as well as cause a tiny amount of pain. Just... more bird agents in general is something i've been hankering for. Or perhaps would it be possible to make some sort of critter that can live solely off creature eggs? Imagine a dragon swooping in to gobble up some of those extra wolfling run eggs that stack up quickly. They don't need to eat to survive but can only breed after they've eaten a few eggs themselves. Perhaps the babies/eggs can make for a super nutritious treat--and give the creatures a chance of revenge for eating their eggs! There could be two different kinds of dragons. A fiery kind and an icy kind. They'll warm or cool the nearby area, respectively. When life gives you flying lemons, make flying lemonade! ... Wait, what? I think we need some kind of extended Creature Remote Control. Like the CRC we already have, it would monitor thoughts and have mind control capabilities, but instead of a few limited actions with no way to choose what object the creature performs them on, there would be every possible action a creature can perform on an object, as well as different buttons to make the creature focus on objects. I might be able to sprite it, if you like pixelated garbage. I WANT. I want SO MUCH. In fact, I volunteer to do the art for this, if someone with the CAOS skill to pull it off will do the coding! I actually used to have that game... I miss it sooooo bad x.x I loved it, and I can't find it *anywhere*. On demand ecosystem could be pretty nice. I think, though, that something that complex should be an out-of-game utility, with an agent part for injecting individuals or sets into the game. I dunno - it doesn't seem that much more complex than Garden Box, really. I was picturing something very similar with a few more toggles and buttons. I might be interested in making some bugs, but since I am working on finishing other projects as of writing it shouldn't be expected to be done very quickly.